The M3 Half-track was a workhorse vehicle manufactured by the United States during the Second World War. It was one of the most widely used vehicles of the war, with many derivatives designed and built on the same chassis. The 57mm Gun Motor Carriage T48 was originally requested by the United Kingdom from the United States as a tank destroyer during the Lend-Lease arrangement between the two countries. The British intended to deploy the vehicle in the Western Desert Campaign. The T48 was based on the chassis of the trusty M3 Half-Track chassis. The back end was converted to carry a 57mm Anti-Tank Gun M1, 122 rounds of ammunition and the crew. The 57mm Gun was a license built copy of the British Ordnance QF 6 Pounder Anti-Tank Gun. A prototype vehicle was ordered in April 1942, with production starting that December. Production continued until May 1943, with 962 vehicles built. By this time, however, the 6-Pounder was seen as becoming unsuitable for the Anti-Tank role in the long term. In 1942, the 6pdr (57 mm) gun had proved an adequate anti-tank gun. It could penetrate 74 mm of armor at a range of 1 km. Come 1943, however, German tanks had upgraded their frontal armor again and the heavily armored Tiger tank was now deployed on the battlefield. The 6pdr gun was no longer powerful enough to knock out every enemy tank. The gun became surplus to requirements with the introduction of 75mm cannons. As such, the vehicle was offered to the Soviet Union as part of the Lend-lease military aid scheme. 650 T48s were received by the Red Army who then designated the vehicle SU-57 (Samokhodnaya ustanovka 57, English: Self-Propelled Carriage). In keeping with the rest of their Self-Propelled Guns and Tank Destroyers. Thirty of these vehicles did remain with the British Army though, the subsequent 282 T48s were split between the US and UK who promptly reverted them back to standard M3A1 Half Tracks by removing the 57mm gun and mount. The SU-57, or T48, was the only American or British vehicle to be used in combat solely by the Soviets. This refers to the T48 in its 57mm carrying form, and excludes converted vehicles, or units captured by the Wehrmacht. The Soviets were already happy with American Half-Tracks, having received a total 404 of the standard M2 and M3 Half-Track. The Soviets formed the SU-57s in separate tank destroyer brigades that consisted of three battalions each with 60 vehicles each. They were also used in separate motorcycle battalions, where they would provide welcome firepower to these lightly armored reconnaissance units. The first SU-57 equipped company to see action was the 16th Separate Tank Destroyer Brigade which took part in the August 1943 Dnepr River Offensive in the Ukraine. In August 1944, the SU-57 equipped 19th Brigade fought during the Baranow bridgehead battles in Poland, some units from this brigade then went on to fight in the Berlin and Prague campaigns in April and May 1945. The Soviet Union gave 15 SU-57s to the Polish military. The vehicles were used by the 7th Self-Propelled Artillery Battery during the 1945 battles in Poland and Germany. In operation, the vehicle would take up a hull-down position behind a berm or ridge, with just the gun exposed. They would often be used as a supporting, second line vehicle making use of the 6-Pounders excellent mid to long range performance. 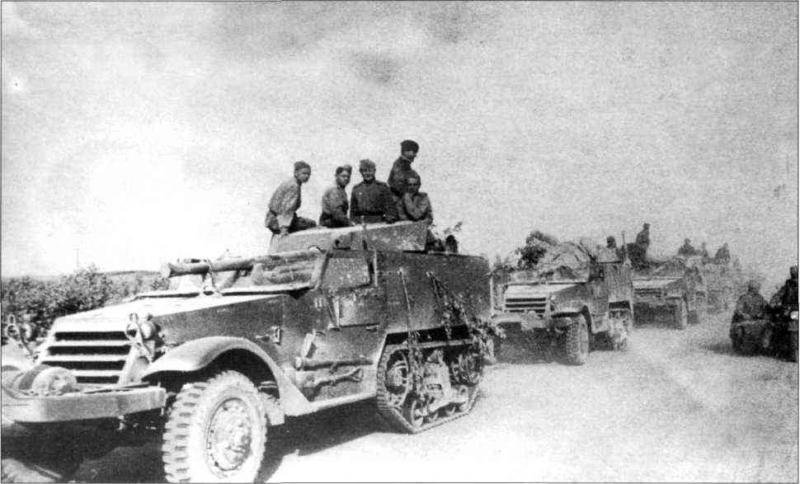 A few of the vehicles did fall into the hands of the Wehrmacht, with a small number being used by the 14 Kompanie, Grenadier Regiment 105 of 72 lnfanterie-Division. An SU-57 covered in Russian snow. 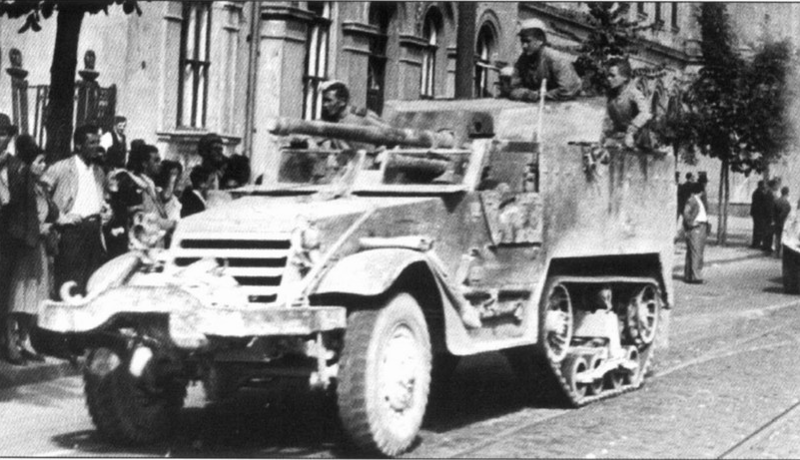 Example of a captured T48 in service with the Wehrmacht. Both illustrations by Tank Encyclopedia’s own David Bocquelet. The Soviet Union also received 52 3-inch GMC M10 Wolverines. A considerably smaller number for reasons unknown. 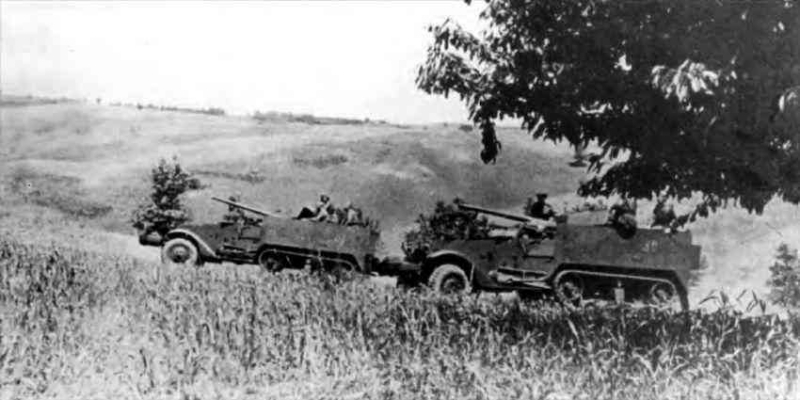 These M10s were formed into two self-propelled artillery regiments known as SAPs (Samokhodno-artilleriyskiy pol). The 1223rd SAP Regiment served with the 29th Tank Corps of the 5th Guards Tank Army, 3rd Belorussian Front during the 1944-45 in Belarus, the Baltics and East Prussia. The 1239th SAP Regiment was the second regiment to be formed with the M10s. They served with the 16th Tank Corps (Later becoming the 9th Guards Tank Corps) of the 2nd Tank Army, 1st Belorussian Front. They served on the 1944-45 Belorussian and Polish Campaigns. Due to their impressive combat performance, the Regiment was honored with the redesignation 387th Guards SAP Regiment. A small number of 76mm GMC M18 Hellcats were also received. These vehicles were not as popular due to their thin armor, and very few were ordered. The SU-57 did not make a huge impact to Soviet War effort but they were put to good use and liked by the crews outfitted with the vehicles. It succeeded in filling a, albeit small, gap in the Soviet Union’s armored force while it recovered from the huge losses sustained in Germany’s Operation Barbarossa. It was a capable vehicle that allowed production of the USSR’s own tank destroyers such as the SU-76 and 85 to get back on its feet. Quite a few of these vehicles survive various museums today. They can be found at the Central Museum of the Great Patriotic War 1941 – 1945, Park Pobedy, Moscow Russia and the Kubinka Tank Museum, Russia. One is also on display at the Polish Army Museum, Warsaw.